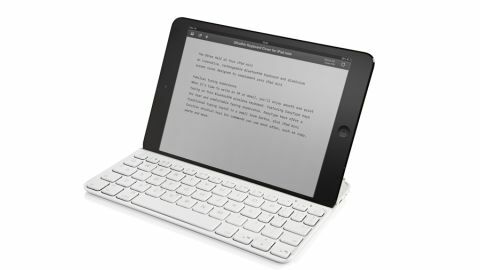 There's no doubt this is the most elegant keyboard cover for the iPad mini you can currently buy, but it's also true that it's not something we'd choose to write long documents on. There's no questioning the quality here - only whether it's a product that will really work for you. We are unashamedly in love with Logitech's original Ultrathin Keyboard Cover, the one designed for iPad 2, 3 and 4. We went so far as to call it the best iPad accessory ever made. Now there's a version for the iPad mini, and a lot of what made us love the original so much is here too. Available in black and white, it attaches to the iPad mini with a hinge, using the same system of magnets as the Smart Cover, so you don't have to wrestle your iPad into and out of a case. It connects over Bluetooth, the battery lasts for a preposterously long time and the keys feel absolutely terrific, with perfect crisp responsiveness. There are some problems with the size of this keyboard, though: despite the fact that Logitech has been very clever in maximising the space for the keys in its necessarily cramped design, this feels like a more compromised design than its bigger iPad-friendly brother. There's no doubt this is the most elegant keyboard cover for the iPad mini you can currently buy, but it's also true that it's not something we'd choose to write long documents on. There's no questioning the quality here - only whether it's a product that will really work for you, however good the design.